A candid documentary exploring the changing face of office environments has cast light on just how sexist the ‘70s really were. For years, men and women have campaigned for equal rights in the workplace and as we draw ever closer to a world in which we’re all afforded the same opportunities, it can be easy to forget just how far we’ve come. Now, filmmakers are casting light on the extreme chauvinism that was once considered status quo by interviewing secretaries from the 1970s – and their bosses. In the documentary, ‘Confessions of a Secretary’, several women recall their unforgettable and altogether unpleasant experiences while working in male dominated industries. Starting as a secretary and making her way up to manager, Jacquee Storozynski-Toll says the harassment ranged from bottom pinching and pranks and to point-blank belittlement. She even recalls being bent over her boss’ knee and spanked; “People were coming and going and no one stopped to ask what was going on," she reveals. "It was like it was a perfectly normal thing to do. You simply can’t imagine it now." That goes without saying - we’re sweating just thinking about the sexual harassment suit – but the publicspanking is just the tip of a very large iceberg and the anecdotes get considerably more shocking. "She didn’t mind in the slightest," he insists. "It’s a disgusting story that would now be considered unacceptable, but at the time it was considered funny." Bell’s recollection leads us to consider women’s attitudes to their own unfair treatment in the workplace and ex-secretary Judi Grossman admits that, for her, tolerating the obtuse attitudes was worth it for the accompanying perks. While the documentary focuses on sexism, it also considers the impact of increased stress. We may have been successful in reducing discrimination but we’ve pretty much stamped out two hour lunches and early finishes. With so many workers suffering from stress, perhaps it’s time to look back to some, certainly not all, of the attributes from the 1970s office. What do you think? 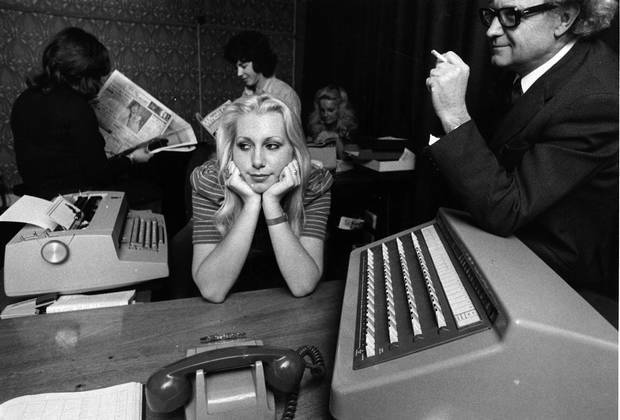 Did you work in a 1970s office – if so, what would you bring back?